Make a super power horse shoe magnet or a magnet wand with the 4M Magnet Science Kit. 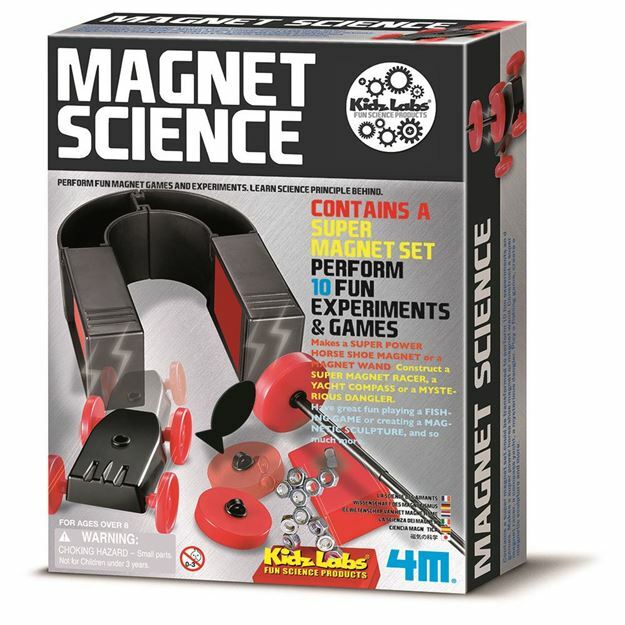 Construct a super magnet racer, a yacht compass or a mysterious dangler.Includes: 2 super power bar magnets, 2 ring magnets, a magnet handle, car/boat chassis, 4 wheels, a long and short axle, rod for fishing wand/yacht mast, fishing wand joint, 2 ring magnet joints, 5 magnetic fish, 15 metal screw nuts, thread and detailed instruction. Age 8+ years. Part of the KidzLabs range. Distributed in New Zealand by Holdson.